January was not a very good month at all on these fronts, at least the first fortnight. The husband and I fell sick with a really bad cough and fever. The cough was so bad that it knocked us off our feet. For nights on end we could not sleep and it went on for about a fortnight. It really tested us. The worst part about being sick was being sleep deprived and running on auto-pilot to complete the chores. Also all workout was out of question. I sorely missed my walks, runs, strength training – all the things I enjoy and that keep me happy. So you can imagine how miserable I felt. But the grateful streak is that all that is behind us now. The body as usual fights it out and fights hard. And I am back to my workouts with the family. So very grateful for it. I never take my health for granted but every such episode makes me appreciate my body even more. And yes, Yoga is back on the schedule especially pranayams since my allergy episodes are on the rise. Parenting is challenging no matter how grown up your kids are. While you read about my troubles in dealing with disrespect in my last post, there was also the happiness of having a plan delivered well. Both the kids had their exams this January. The older son had his pre-boards that he managed well. The younger boy also did quite well. He followed a disciplined approach, making a time table to study and learn. I helped him out by supervising and revising with him. Made me realize that he is not completely ready to self study as yet. It was happiness when he scored well, more because of the joy that he felt at his own accomplishment. Of course, the temper tantrums are still a work in progress. And making him sit down to study is still a task. Coco, as always, continues to inspire me with his happy demeanour and ready hugs. And boy can he run! Only the older son can actually run with him. 🙂 We lesser mortals jog along. I am very grateful to have them in my life, for their smiles, hugs, ready forgiveness, care, compassion and how they are getting to be my friends as they get older. No matter how much I struggle sometimes with parenting, my kids are my joy! As mentioned in my last post, my presence on social media is sporadic and targeted. I am working on my Pinterest and Instagram profiles now purely from my work point of view. Glad to see positive small steps in both. Here is how my Pinterest profile is doing. Check out my stats in November when I wasn’t working on it to my stats in January end. Slowly and steadily, there is progress. For those who wanted to know, I got about 700 clicks to both my blogs in January from Pinterest as compared with about 50 in December. Good work in progress for sure. 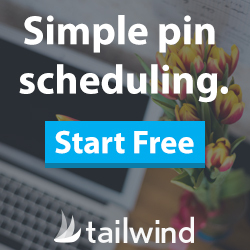 TailwindApp has been making scheduling my pins and keeping track of analytics a breeze. I was so happy after trying Tailwind Plus in January that I renewed it to an annual subscription this month end. 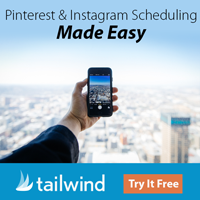 If you haven’t you must try the Tailwind App for Pinterest, it takes the toil away from pinning and scheduling. You will love it! My morning househelp went for an extended leave while I was sick, the one in the evening has been an even tougher cookie. A new one who joined quit in about 10 days. Got another one who left for a long leave within 2 days of joining. She came back after more than a week. The news was sad. Her mother had passed away. It was quite horrible. My inconveniences and troubles seemed so small then. So very grateful for my helps to help me handle my work load and keep me sane. This was the first month without cable and it went off quite well, I must say. I managed to finish watching the absolutely delightful Sherlock (I know I am so late! ), read the book and watched the movie of A man called Ove and was happy when both the kids read and enjoyed the book as much as I did. As an avid Homeland watcher, I am glad that the new season starts this February. Really looking forward to it. Have a few books that I must get to soon. Can never feel grateful and humbled for my work which gives me the flexibility to balance work-life and also find joy and fulfilment. 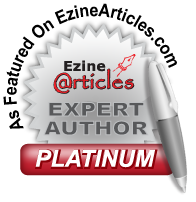 I thank my wonderful clients and colleagues for my Editorial and writing work who are a delight to work with and teach me so much. Also extremely grateful for all my blog collaborations and constant work with brands that keeps me energized and well compensated for. With us experiencing an unexpectedly chilly January, it was a month when I cooked a lot with the seasonal produce especially peas and red carrots. Some of the recipes are already up on my cooking blog if you’d like to try them. Have been making the instant green chilli pickle regularly as everyone at home loves it. February is going to be a much better month, I reckon. At least I hope. How was your January? Do join Vidya’s #GratitudeCircle this month and every month. Sounds like a good month in spite of falling sick and the bumps in between. Glad to hear things are back on track in terms of health. Posts like these really do force you to look for the silver linings. Hope Feb is a good month for you! Thanks, Sanch. Yes, periods like the one I had really made me look for the bright spot. Hope that the health continues to be in a good place. It’s a big relief when your cough is finally over, especially without the antibiotics. And you’re in to say something like that followed by a “touch wood”. Gosh! A long bout of cough is such a pain. The weather is really weird. It’s nice that your children are upping the responsibility game. And yeah, dutiful house helps deserve a standing ovation. Some of them turn up for work as though emerging from ravines of dearth & poverty. Yet their dreams about their children are so endearing & that’s what makes us respect them more. Coco is such a happy dog… I love him already. Your food pictures always do strange things to me tummy. If you ever make egg biriyani, please share the recipe. Glad you are back on your schedule… Hope working out brings back all the lost energy ? Thanks, Raj! Yes, he is a fantastic boy. Thanks so much for liking my food pics. Sure, I will keep that in mind. Yep, working on my energy now. When our health suffers because of the weather, or our own busy schedules, it’s time for us to slow down, catch our breaths and take it easy. That’s how I look at it now. I am glad you are back on track now. And, the month seems to have gone pretty well in spite of it all! Kids and pets do keep us feeling charged with their love, isn’t it? Do take care of your health, Rachna..and may February bring about a lot of good cheer and loads of happiness in your home! Shilpa Gupte recently posted…Thankful. Grateful. Blessed. Trust me, I was resting as much as possible. But with the maid not coming and the husband also sick, it was quite difficult. And one has to send the kids off to school. They had their exams at that time and that means extra work for us to supervise. Also all the cooking and my own writing work is not really avoidable. But glad to be well now. Thanks Shilpa. I am paying more attention to my health though I wonder what I could have done to stop a seasonal flu. Wish you a very happy February too. 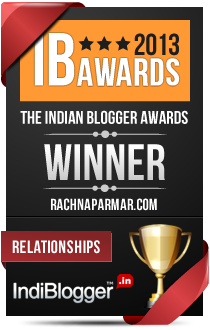 It’s good that you are better now, Rachna. You are right, you know, no pain no gain. Though it’s not easy navigating through tough times it does give us some perspective and a much needed reminder of the things we need to be grateful for. Have a great February, Rachna. Thanks, Naba. You are absolutely right. Wish you a nice Feb as well. It is one thing when children fell ill but when parents fell ill, everything goes for a toss. I agree with you, no matter how difficult parenting gets with kids’ tantrum days, our own tantrum days, the parental conflict days but the bottom line is our kids are sheer joy. 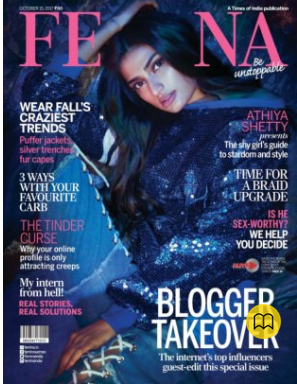 While I have started to get organized with my writing and blogging from this month, I can see there is a lot more to accomplish in blogging and you are one of the bloggers who is inspiring. And, we can never forget to be grateful for our househelps. 2 consecutive days they don’t turn up for work and we bear the heat. Wish you a wonderful and fulfilling February. Thank you, Anamika, for your warm words. It is good to learn new things and a thrill in implementing them. Yes, kids falling sick is bad but being sick is so much worse especially when no one else is around to help. I liked the concept of trying to find the good amongst the not-so-good happenings around us. Hope everything turns out better in the next month for you, Rachna. Thanks. I like it as well. Wish you a good February as well. Uff falling ill is terrible. I don’t know what’s worse, tending to an ill person or falling ill yourself and not being able to get on with the chores. Glad you’re back on your feet. I totally hear you on managing kids and exams! 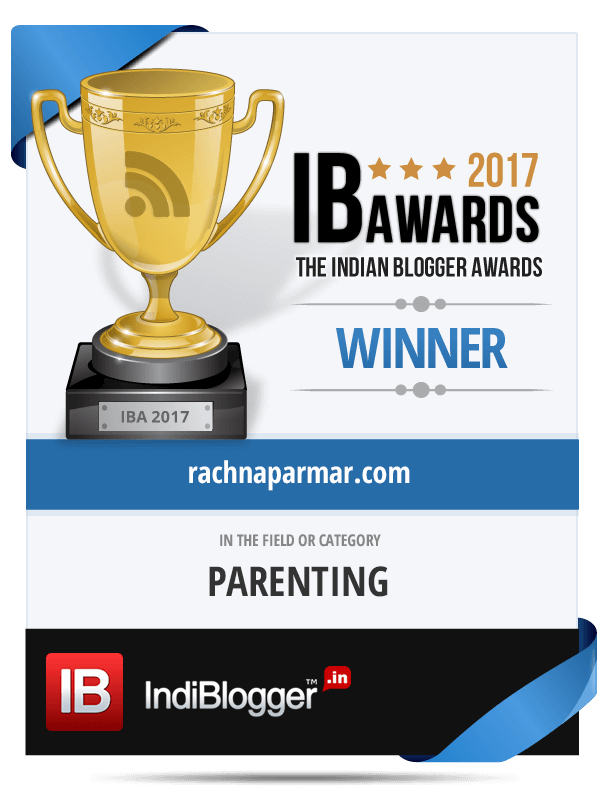 I need to go back and read you older post – have been out of the blogging circuit for a while. Tending to ill kids does break our hearts but it was tough being sick and the husband also being sick. The maid not coming just made it so much worse. One night I sat and wept, I was so frustrated. But yes, great to feel well. Oh how that feels after you’ve been unwell. Yep, it was tough. Always a pleasure to read your gratitude posts, yours and Vidya’s, each month. Sorry to hear about the health front. That must have been terrible, to be sick at the start of the year. Good to see you’ve bounced back to your routine again. Yay on the food blog and Pinterest. Very happy for you. Agree completely that Tailwind is such a lifesaver. I still do some manual pinning but now that it’s mostly automated, my life is better for it. Huge hugs to G and S on their performance. Must be very gratifying when the kids do well. May they shine in everything that they do. Your food pictures are getting so much more delicious. How lovely! Kudos on the work front too. Must be very nice to see that kind of appreciation and sustained stability in doing something that you enjoy. Wishing you all the best for a wonderful February with lots of good health and cheer. Wishing S all the best for his exams in March. May he shine. Glad to hear your health is better now, Rachna. Nothing like ill-health to make us take a back seat eh? I’m happy that you are now back on your feet and back to working out too. Your working out tweets inspire me a lot, please know that. I love your recipes day by day and while I cannot make non-veg at home, your vegetarian recipes have always been a hit at home! I’ve bought red carrots and I’m looking forward to make kanji over the weekend. I know a lot of women who struggle with their househelps. While they have tragedies of their own, somehow you cannot always trust them to be true. The maid at my MILs place has killed her father atleast thrice now. No one know is he’s still around or not. Since, I do not like dependencies, I have no maids at home. It is hard to do everything at home, but still I find it better than waiting on/for someone to do it for you. Maybe it is difficult once you have kids. My January was pretty good and I have just written about it. 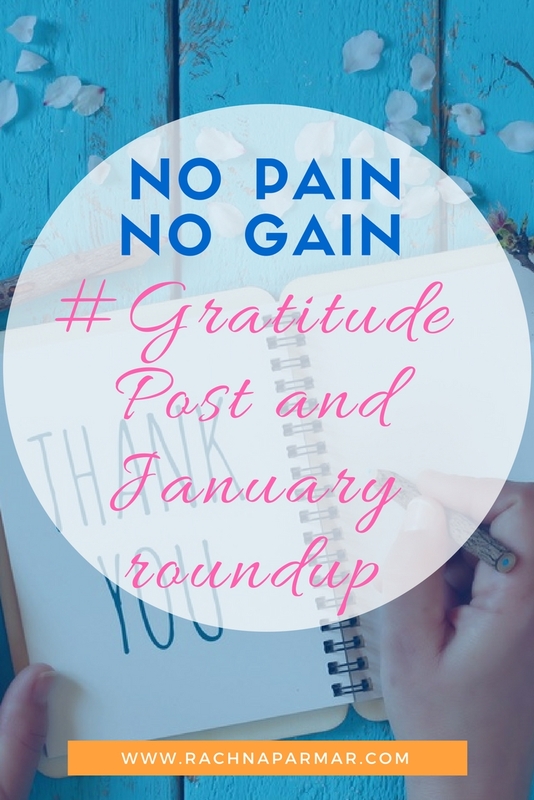 You are one of the bloggers who inspired me to include a gratitude list in my month-end posts, so I have. Wishing you a healthy, happy and stress-free February, Rachna. I am sorry to hear that your husband fell sick. Hope he’s feeling much better now, Rachna. Coughs are terrible and nothing seems to help. Great to hear that the boys did well with their exams. Wonderful work on the Pinterest front! I am still sitting on the Tailwind fence, you know! Maid woes-ugh! they seem to have a sixth sense for when to bunk. It has been good to see your delicious food photos on Instagram! About your work–can’t imagine anyone not appreciating you! 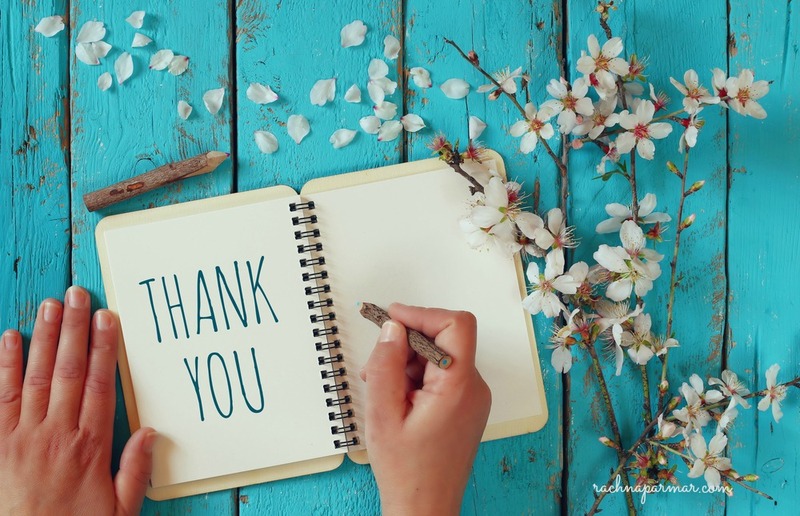 Wishing you a healthy February ahead, and thank you so much for joining the Gratitude Circle. The ill health did sound dautning and than god that its over now! I thin kits the Bangalore weather that leads to bad coughs and colds – I used to suffer from them too while I was there. Glad to see you reaping the benefits of seasonl fruits/veggies – that kaanji looks delish! I have started a veggie garden again -mostly inspired by your posts on your garden! Wishing next month is better health wise and gives you more highs everywhere else!! Each month has its ups and downs. And the downs really make us look for and appreciate the silver lining, which is so important! Enjoy reading your gratitude posts and hope your health is better now. My thoughts with your maid who lost her mother but happy she is back to ease the burden. Wishing you an extraordinary March.